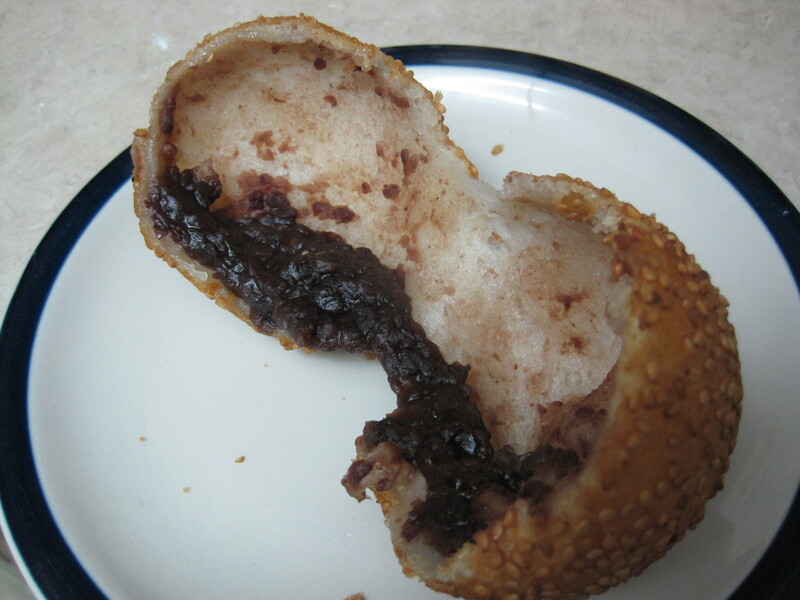 Jien duy are deep fried, sesame seed coated, glutinous rice balls with a sweet red bean paste filling. These homemade jien duy are the best that I have ever had and I’ve even tried the jien duy in China. These are crispy on the outside, light and airy on the inside, and they have a perfectly thin layer of sticky and chewy glutinous rice flour. These are best when served warm and the day that they were made. They’re surprisingly easy to make, but getting the oil to the right temperature can be a bit tricky. In a large, heat proof bowl, mix together the glutinous rice flour, rice flour, and baking powder, and set aside. In a sauce pot, bring the water, sugar, salt, and oil to a rolling boil over medium high heat. Then turn the heat off and immediately stir in the potato flakes. Once the mashed potato mixture is smooth, immediately pour the hot mixture into the bowl of flour and mix well. Once the dough is cool enough to handle, knead it on a silpat (silicone) mat until you have a smooth and only slightly sticky dough. Make one sesame ball at a time. Moisten your hands slightly with a bit of water if the dough is too sticky to work with. Pinch off a piece of dough that is about the size of a golf ball (or larger if you’d like). Roll it into a smooth ball with your hands and then flatten it slightly with the palms of your hand. Then use your fingers to gently stretch out the edges so that you have a larger, flat circle, but be sure to make the middle of the circle thicker than the edges. This will help prevent tears. 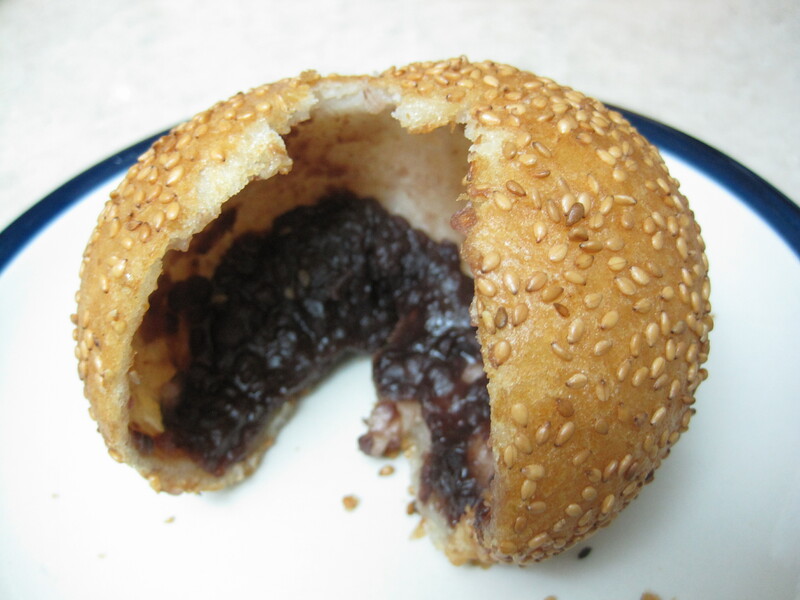 Then use your fingers to roughly shape approximately 1 tablespoon of the sweetened red bean paste into a rough ball. If your filling is chilled through and if you minimize how much you touch it, it shouldn’t stick to your fingers. Place the ball of filling into the middle of the dough and then wrap the edges of the dough around the filling and seal the opening by pinching it closed. Be careful not to tear the dough. Roll it gently in the palms of your hands to smooth it out and then roll it in a bowl of sesame seeds. Press down a bit so that you get a good coating of sesame seeds. 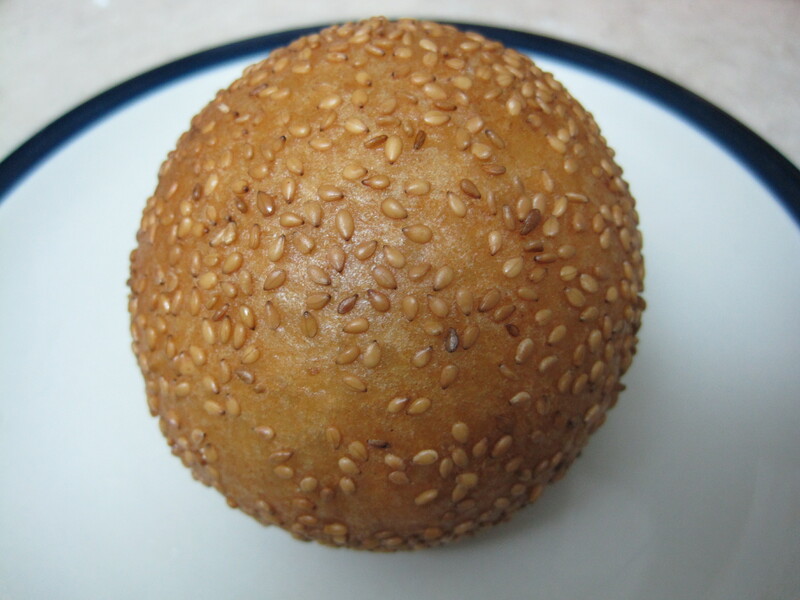 Roll it gently in the palms of your hands to reshape it and to set the sesame seeds. Then place it on a plate and repeat making more sesame balls until you have used up all of your dough. Deep fry the sesame balls starting with the ones that you made first. Otherwise, they will stick to the bottom of your pot and burn. When you have used all of your dough and filling, heat a wok or large pot of vegetable oil that is 3 inches deep over high heat. The deep frying step of this recipe is the most important and the most difficult part. Unlike making other deep fried foods, the oil can’t be very hot (i.e. less than 350 F) and the jien duy must be deep fried slowly. If the oil is too hot, you will end up with dense, greasy, and soggy jien duy. Unfortunately my thermometer was in a moving box when I made these, so I can’t tell you what the exact temperature was. But if you sacrifice just a few tester sesame balls, you’ll be able to figure out the right oil temperature. When you place your hand above the oil, it should feel a bit warm, but not hot. Also, when you place a tester ball into the oil, small and gentle bubbles should immediately form around the ball. Turn the balls constantly in the oil as they cook for even browning. The frying time should take between 12 and 20 minutes. (Note: I know that sounds like a long time, but it really is necessary. I tried making these using a higher heat and a shorter cooking time (less than 10 minutes) and the resulting balls were not hollow or crispy, and they were inedible in comparison.) They will expand, start to float, and brown as they cook. When they’re done, they will be crispy on the outside, hollow and airy on the inside, and the filling will be heated through. If your sesame balls get too browned too quickly, or if the bubbles surrounding the balls are too vigorous in the beginning, then the oil is too hot. Sacrifice one tester at a time until you are certain that you have the right temperature. Then deep fry the rest of them in two or three batches. Transfer them to a brown paper bag lined plate and allow them to rest for a few minutes before eating them. Be very careful because they will be very hot and the steam could burn you. These are best when enjoyed fresh and warm. could it be possible for me to put this in the oven? Hi Izzi, Thank you for your question! I don’t think that this would work in the oven. But if you try it, please let me know how it works out! The next time I make this, I will test one in the oven to see.